Amid a tenuous time for the island's cash-strapped rail project — with transit officials still uncertain how to cover the ballooning costs to complete it — city leaders have again deferred a deal that would allow rail to borrow hundreds of millions of dollars leveraged against the city's general fund. The total amount that the rail project will need to borrow to cover expenses during peak construction has now been put at $1.9 billion, according to a newly disclosed estimate. On Wednesday, members of the City Council's Budget Committee, some of them visibly frustrated, held off for the second time in less than a month approving a deal that would allow the rail project to borrow money for the height of construction. Star-Advertiser. 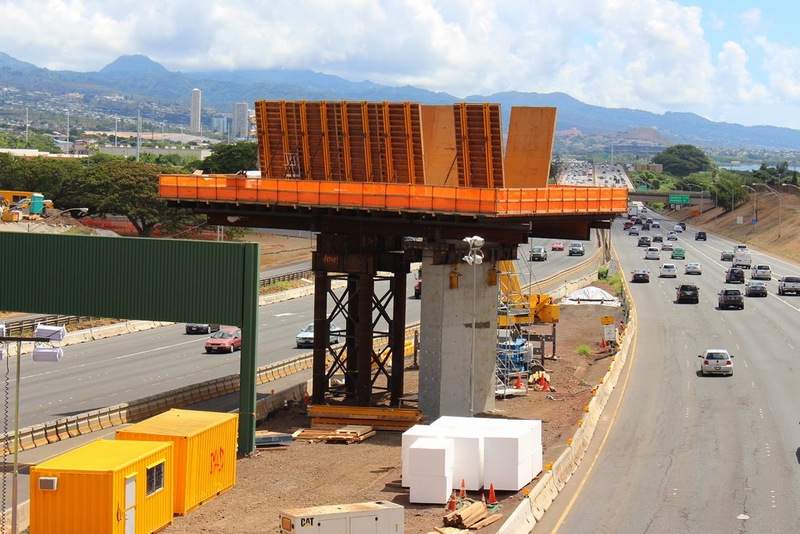 Forget about the nearly $1 billion shortfall, Honolulu’s rail project has a cash flow problem that could halt work as soon as this summer. Construction costs are now outpacing the money trickling in from taxes and the federal government. Civil Beat. The $5.3 billion price tag attached to the controversial rail project is a best guess at this point, Roy Amemiya, the city's new managing director, admitted Wednesday to members of the City Council. KITV4. Thousands Testify on Bills to Restrict Aquarium Fishing in Hawaii. Business and environmental interests collide in the Capitol during a marathon hearing. Civil Beat. Gov. David Ige’s selection of Carleton Ching to head the DLNR has environmentalists howling that the longtime lobbyist for the development industry isn’t qualified to lead the state’s efforts to safeguard and steward its public land. They also say there will be too many conflicts of interest for the man currently on leave from his job at Castle & Cooke, a major land developer. Civil Beat. Four more of Gov. David Ige’s appointments sailed through Senate committees with unanimous support Wednesday. The latest round includes his picks for budget director, Wes Machida; deputy budget director, Roderick Becker; tax director, Maria Zielinski; and human resources director, James Nishimoto. Each nominee was backed by reams of glowing testimony. Catherine Awakuni Colón, Ige’s appointment to head the Department of Commerce and Consumer Affairs, cleared her Senate committee hurdle Monday. Civil Beat. If the Hawaii state Legislature is in session, no doubt some lawmaker somewhere is holding a campaign fundraiser. Civil Beat. A bill that would allow patients or their caregivers to transfer medical marijuana plants to other patients passed through the House Health Committee on Wednesday. Civil Beat. A bill aimed at easing restrictions on news media reporting about lava flows and other natural disasters cleared its first committee in the state Legislature this week. Tribune-Herald. Spotty Health Connector Service Leaves Micronesians Waiting. Hawaii Public Radio. Opinion: The Hawaii Legislature’s Persistent Rhythms. There are some longstanding reasons why change comes slowly at the Capitol, if it comes at all. Civil Beat. University of Hawaii athletic director Ben Jay is expected to paint a bleak picture of future department finances — including the prospect of record deficits and some options for cutting sports and raising fees — in a scheduled report to a Board of Regents committee Thursday. The athletic department has run at a deficit for 11 of the past 13 years and has been projected to finish $3.5 million in the red for the fiscal year that closes June 30. Star-Advertiser. Hawaii Lawmakers Seek Cash for Police Body Cameras. The House and Senate are considering bills to help purchase cameras for officers and their vehicles in an effort to boost police accountability. Civil Beat. Local grocery markets in Hawaii report that the slowdowns at West Coast shipping docks have been causing some delays, but no serious shortages have occurred since the dispute began causing delays three months ago. Pacific Business News. Even though the West Coast shipping docks dispute is not supposed to interfere with domestic carriers, Matson, as well as PMA, have admitted that the congestion at West Coast docks has triggered a domino effect leading to the delay of some container shipments to Hawaii. KHON2. A former Halawa Correctional Facility guard is headed to federal prison for eight years for taking bribes from a gang to smuggle drugs and cigarettes to inmates. Star-Advertiser. A bill that bans people from sitting or lying down at four Chinatown and downtown Honolulu pedestrian malls was signed into law by Mayor Kirk Caldwell on Wednesday. Star-Advertiser. If the public has its way, a redevelopment of the Neal S. Blaisdell Center in Honolulu would feature more performance venues, more attractions, more open space but perhaps ditch its exhibition and sports arena functions. Pacific Business News. A low-income senior rental housing project on state and county land in Kakaako is in line for major renovations under a local developer's plan to buy the project, called Na Lei Hulu Kupuna. Mark Development Inc. received tentative state approval Wednesday to proceed with a proposed leasehold purchase of the 75-unit studio apartment complex at 610 Cooke St. Star-Advertiser. The grandmother of Katherine Kealoha, wife of Honolulu Police Chief Louis Kealoha, is asking a state jury to award her $1 million in punitive damages in her civil claim against her granddaughter. Star-Advertiser. A new study is underway focusing on the coping mechanisms used by the folks affected the most by volcanic gas emissions — the people who live downwind of Kilauea Volcano. Star-Advertiser. While residents of lower Puna await what Madame Pele has in store, a nonprofit animal rescue organization has been busy rescuing cats from the still-active June 27 lava flow from Kilauea Volcano. Tribune-Herald. Eight of the nine Hawaii County Council members are heading to Washington, D.C., later this month for the annual legislative conference of the National Association of Counties. West Hawaii Today. In several letters over the past couple of months, county officials have called on the National Park Service to sit down and discuss their differences on how the Keauhou aquifer should be managed. Park officials say they have sent three letters expressing just as much eagerness to set a date for negotiations, a requirement of a preliminary order by the state Commission on Water Resource Management. West Hawaii Today. Tuesday evening, union workers at the Waikoloa Beach Marriott Resort &Spa overwhelming approved to ratify a new contract. West Hawaii Today. A much-needed face-lift; Results of Riverside Apartments renovations unveiled. Tribune-Herald. Hawaiian Telecom technicians reported that all services have been restored to customers on Hawaii island after a cable was cut, causing many residents to lose phone and internet service on Wednesday. Crews successfully replaced the cut cable with a new cable, and completed splicing more than 500 feet of cable, restoring all services to impacted customers just before 7:30 p.m. Hawaii News Now. State and local agencies have been working diligently to combat the more than 20-acre little fire ant infestation reported in Nahiku in October, but some landowners are concerned that the pesticides being used may be damaging East Maui's ecosystem. Maui News. Demolition at Kanaha Pond State Wildlife Sanctuary has residents worried about future development at the royal fishponds, but a wildlife biologist assured the public that the work is intended to protect resident native Hawaiian birds. Maui News. Having the county instead of homebuilders be responsible for developing new water resources would not only spur much-needed housing development but "right-size our community," Mayor Alan Arakawa said Tuesday. Maui News. A Maui High School teacher has been put on indefinite leave by the Department of Education pending an investigation into a sexting scandal. Hawaii News Now. Haleakala National Park began accepting applications for guided astronomy and hiking tour permits on Tuesday, Feb. 10, 2015. Maui Now. An outdoor burning bill being considered by the County Council would make it illegal and a public nuisance for “any person, firm, or corporation in the County of Kauai to intentionally, knowingly, or recklessly cause, permit, or allow to escape into the open air” smoke, soot, poisonous gases, dirt, dust or debris of any kind that can injure a person’s health or damage property. Garden Island. An Oregon-based environmental attorney who successfully represented a community group in Washington state in a lawsuit against an industrial dairy in Yakima Valley has agreed to represent Friends of Mahaulepu in its fight to stop the dairy proposed for Kauai’s Southside. Garden Island.